I finished reading Elizabeth Cline’s Overdressed . Besides the issues of pricing goods and the use of cheap labor that I talked about in this post, there’s a good discussion of the environmental impact of all these garments. The total cost of Superfund cleanup, demolition and restoration, including FMC’s contribution, is projected to be $150 million. And it’s not only the synthetics and blends that cause environmental damage. Twenty-two billion pounds of weed killer is used in cotton crops annually just in the United States. (Overdressed, p. 125) Many fibers are also bleached, dyed, given special coatings and so on, each with its own run off. While the United States has implemented stricter regulations and also developed technological methods to reduce the environmental impact of creating these items, textile production has largely moved overseas to countries with fewer regulations for both environmental concerns and employee work conditions. Some US companies do monitor overseas factories with audits and/or prescreening. However, factory managers often know when audits will occur. According to Overdressed, as many as 75% of WalMart audits are announced in advance. (p.148) Other companies, such as Nike, make unannounced visits. However, there are still instances where the US companies simply do not know where their garments are being produced. This seems absurd – how can they not know where their products are made? Factories that pass the companies’ evaluations will sometimes subcontract work to other factories without the knowledge of the company. These subcontractors often don’t follow the same environmental or labor standards. People used to look for quality clothing that would last. Garments were mended as needed to make them last longer. Today’s fast fashions come with lesser quality fabrics and speedy sewing designed to get the clothing to market quickly. If the seam pops or the hem comes unstitched in the second wearing, the garment is likely to be discarded without thought – after all, it was cheap, who cares? Those who can sew likely know the true value of quality clothing. If you sew for yourself, you can create pieces that fit your unique body. You aren’t stuck with the boxy trends pushed by retailers one week and body hugging slinky tops the next. Check out Elizabeth Cline’s book, Overdressed: The Shockingly High Cost of Cheap Fashion , and you’ll find yourself even more inspired to get sewing. If you make goods for sale, is your pricing truly anywhere near retail? 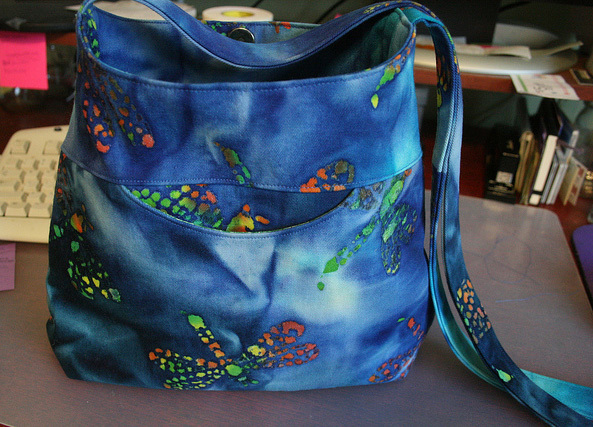 Take this bag I made from a Michelle pattern. Let’s say it has $8 in materials, which is probably a conservative estimate since it has a magnetic snap, zipper and interfacing as well as the inner and outer fabrics. I added a zippered inside pocket and a cell phone pocket inside as well. We’ll say it took 2 hours to make. I’m fairly certain it took me quite a bit longer than that as I recall some unpleasantries at one point when I was reading and re-reading a section of the instructions. Minimum wage here is $7.25, so we’ll use that to determine the labor expense, even though it’s ignoring some of the other costs. So, this bag cost $14.50+$8 = $22.50 and should then wholesale at $45. Using the formula above, it would not be unreasonable to give it a retail price of $101.25. Now, this is a nice bag. I like it a lot. However, I very much doubt anyone would pay $100 for it. Well, first, we could probably lower our materials cost if we were buying in larger quantities, so maybe it only cost $4 in materials. That doesn’t help much; it’s the labor that’s driving up the price. Let’s send it to a country with a labor cost of $1/hour. Look, now it has a total cost of $6, a wholesale cost of $12 and a retail price of $27. Is that an acceptable price to the American consumer? Perhaps it is. As a matter of fact, I found an etsy seller offering this bag (without the extra pockets I added) for $29 and another offering it for $28. But, neither of these sellers lives in a location where labor costs are $1/hour. Perhaps the sellers offering this bag look at the $28 price and see it as they are earning $20 since their materials cost $8. But are they really? Maybe that $10/hour for two hours of sewing the bag doesn’t seem too bad. How long did it take to photograph the item and prepare the sale listing? What about the fees for selling in the etsy marketplace or the additional fees taken by Paypal or etsy for processing the payment? Did the bag pack itself, print a shipping label and hop over to the mail drop or post office without the seller’s involvement? And if no one is willing to pay $100 for my lovely bag, how are sellers supposed to price their goods? I don’t know what the answer is, but I’d love to hear your thoughts.